It’s easy to get confused about how to build a habit stacking routine. In fact, you might think it’s a series of random activities thrown together in a haphazard manner. That can’t be further from the truth! When creating a stack, you want to consider a few important elements: Why are you choosing each action? What order should they go in? And how long do you spend on each activity? To keep things simple, I recommend using the following nine rules to build your habit stacks. 1. Attach the stack to an existing habit. If-then plans (also known as implementation intentions) can help you stick with a goal and, more importantly, will prevent those times when you want to skip a day. The idea here is to identify an existing habit then create a plan for the specific action you’ll complete immediately before or after this routine. As you can see, each if-then plan is attached to an existing behavior. So, once you create an if-then plan, all you need to do is add a reminder to make sure it’s completed. 2. Complete each habit in five minutes or less (usually). Let me start by saying that the five-minute rule isn’t written in stone. Instead, use it as a general rule of thumb. So, if you feel that one habit is important, but it takes longer than five minutes, then it’s okay to add it to your daily stack. Just remember this: you only have a limited amount of time to work on self-improvement, which for most people is a daily average of thirty minutes. This means it’s easy to complete ten habits that average three minutes of effort. But it also means you can’t complete too many small actions if each requires ten minutes of effort. I recommend five minutes because it’s a basic unit of time in which you can accomplish a surprising number of things, while being short enough that you can stack each action on top of another. Five minutes is 0.35% of your day. Just one-third of one percent of your day will help you create a habit that results in long-term change and benefits. That said, if a specific action takes slightly longer than five minutes, then it’s perfectly okay to add it to your routine. If it’s important to you, then you should make it part of your daily activity. 3. The entire routine should take under thirty minutes. The “thirty-minute rule” is a sweet spot where you can complete many habits without it interfering with everything else in your life. But if you’re super busy, then it’s okay to do twenty-, fifteen-, ten-, or even five-minute stacks. Again, the most important thing to remember here is consistency. You’d be surprised at how many “little things” can be squeezed into a half hours’ time. In fact, when you get to Part V of the book, you’ll discover a large assortment of important habits that can fit into anyone’s busy schedule. 4. Build daily, weekly, and monthly stacks. Some habits don’t require daily effort. Instead, they are best completed on a weekly or monthly interval. For instance, certain actions only require the occasional “checkup,” like reviewing your credit card purchases, inspecting your smoke detectors, and checking your tire pressure. Each is important, but it’s better to schedule these actions on a weekly or monthly basis. My advice is simple: not only should you build daily stacks, but you should also schedule time once a week and once a month to complete those important but not urgent activities. For the weekly review, you could schedule this activity late Sunday night as a way to prepare for the workweek. And for the monthly review, you could schedule it for the first Saturday of each month. But it really doesn’t matter when these activities are scheduled. The important thing is to put these stacks into your calendar so you’ll follow up on them. 5. Each small habit should be a complete action. There should be an obvious starting and stopping point. In other words, you should avoid habits where you could easily do more of it if you had time (like exercising, writing, or anything related to your job). It’s better to schedule these activities for a different part of the day when you can devote more time. For instance, there isn’t a lot of value in cramming five minutes of exercise into a stack because it won’t give you the full benefit of improved fitness and strength. Instead, a better use of your time is to pack your gym bag for the day or record a workout from the day before. Each action supports your larger keystone habits and has a clear starting and stopping point. There is one major exception to this rule. You could add the occasional “elephant habit” to your daily stack to make forward progress on an unpleasant task. By chipping away at this project in small five- to ten-minute increments, you won’t procrastinate on the tasks that you know need to get done but aren’t very fun. Each small action should be easy to complete without requiring a lot of brainpower. The idea here is to do it quickly and then immediately move on to the next action. If you need time to complete a series of steps, then perhaps you should schedule this habit for another time in the day. Remember, each activity should only require a single step, or maybe two steps, to complete. Examples include making a bed, packing a bag, preparing a smoothie, or updating your expenditures from the previous day. 7. Map out a logical progression for each routine. The entire routine should flow like a well-oiled machine. This is key because you want to avoid wasting time and moving from room to room. For instance, let’s pretend you complete two actions in your bedroom, three in the kitchen, and two in your office. It would be a mistake to put these habits into an order where you’re running back and forth between rooms. Instead, schedule them in a logical flow that matches the normal actions you complete with your existing routines. Just think back to my eleven habits from the previous section. Almost all the habits are completed in a logical progression where I move from the bathroom into the kitchen, then to the dining room, and finally to my office. There is no wasted effort because each action is anchored to a specific spot in the house. 8. Use a checklist to manage the process. A stack isn’t made up on the spot. It should be a set of actions that you determine ahead of time that are personally important. This means putting each habit into a step-by-step checklist that you’ll refer to constantly. This checklist should be a set of actions done the same way, in the same order each day. Sure, it’s okay to add or delete certain habits if they don’t work for you. But the only way to stick with this routine is to turn it into automatic behavior. In fact, when you do it often enough, you’ll complete these actions without consciously thinking about why you’re doing them. You’ll simply act on autopilot. The choices are practically infinite here. There are hundreds of different tools you can use to store this checklist. Just pick one and stick with it! Never underestimate the power of checklists. Not only do they help people stay organized, but they also save lives. For more on this, I highly recommend The Checklist Manifesto by Atul Gawande, which talks about how simple checklists have been proven to save lives in the airline and medical industries. 9. Include habits that relate to your priorities. Remember, the benefit of habit stacking is to take action on your important, personal goals. These should be outcomes you want to achieve—not what others want from you. In fact, at no point should you feel like you “must” do a specific habit. Instead, each task should have a clearly identifiable benefit that you’re seeking. The choice here is yours. If you can’t identify a clear benefit of an activity, then it shouldn’t go in the routine. Okay, you now know the rules for building a stack, so let’s shift focus and discuss the how-to part of the process. 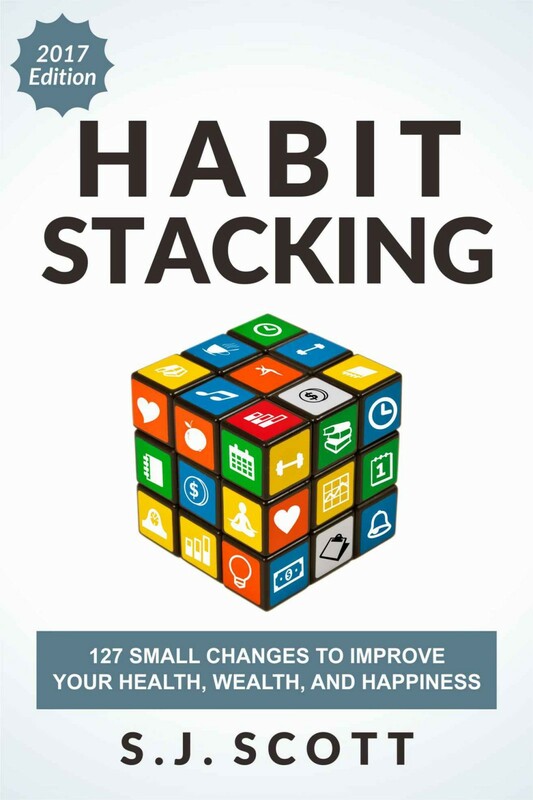 Specifically, I’ll detail the thirteen-step process for building a habit stacking routine.